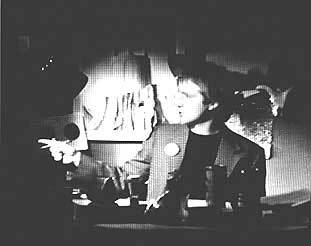 In Lenny's Documentary (1978), Bourn as Lenny sits at his desk, in his den, surrounded by familiar objects, his props. Lenny is a fictitious character. As Bourn himself has written 'a mixture of all the friends I hung about with and people I met on the streets of Leytonstone. But he was also a possible version of myself, expressing things I'd never been able to before. The objectivity it allowed me meant I could mix humour and seriousness in what was an incredibly bleak vision of the world.' Lenny struggles to articulate but he's never lost for words, they pour out of him in stream-of-consciousness fashion, like a Samuel Beckett character: he must go on saying what he means, whilst making meanings of what's in his head. Lenny's head-and-shoulder image is that of television's authoritative factual-programme presenter - he is after all an authority on Leytonstone and its environs.